That and coffee is what keeps me going. 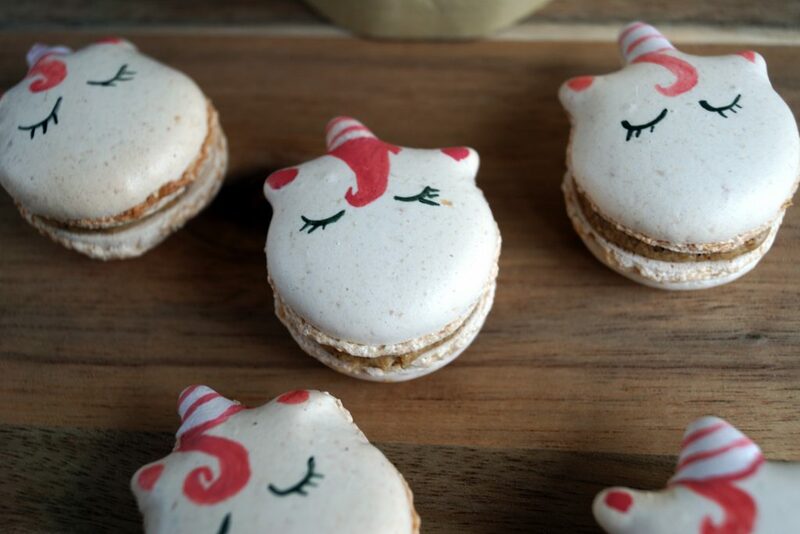 And it may not come as a surprise that I celebrate the international day of Macarons with a coffee Macaron in the shape of unicorns. The goodie bag of the last foodblogger camp came with a package of Tchibo blonde roast, which should also be available in Stores and online as of this week, and that inspired me flavourwise. 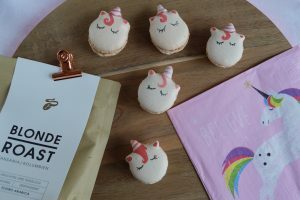 I tasted the coffee during a hand filtering session with Karen at the camp and found it to not be my cup for drinking but the flavour pairs well with the white chocolate in the Macaron filling. Prepare the Macaron mass acording to instructions and add a few drops of coffee flavour to the meringue. I brought mine from France, it didn’t need much to add a soft coffee flavour to the mass. Fill 2 tbsp of the base into a piping bag with a small round outlet of maximum 0.2 cm. Fill the rest into a piping bag with the bigger round nozzle. Pipe the regular rounds with the bigger nozzle. To half of the rounds add 3 triangles with the small nozzle, 1 pointed triangle for the horn and 2 smaller triangles each left and right of the horn for the ears. Sprinkle the „regular“ rounds with a little coffee crounds for flavour and crunch. 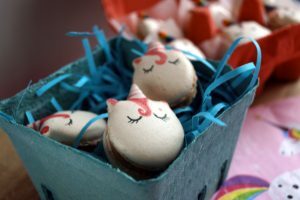 Decorationwise there are almost no limits, I had seen a few designs before on Pinterest and Instagram and painted my Unicorns with food colours and rainbow dust. Let dry completely before you fill them with coffee ganache. Place the cream and the ground coffee in a pot, slowly bring to boil. Set aside and let the coffee brew while you melt the white chocolate over a pot of simmering water. Once the chocolate is melted, pour the cream though a fine sieve onto the chocolate. With a spatula combine the two parts and let cool completely. 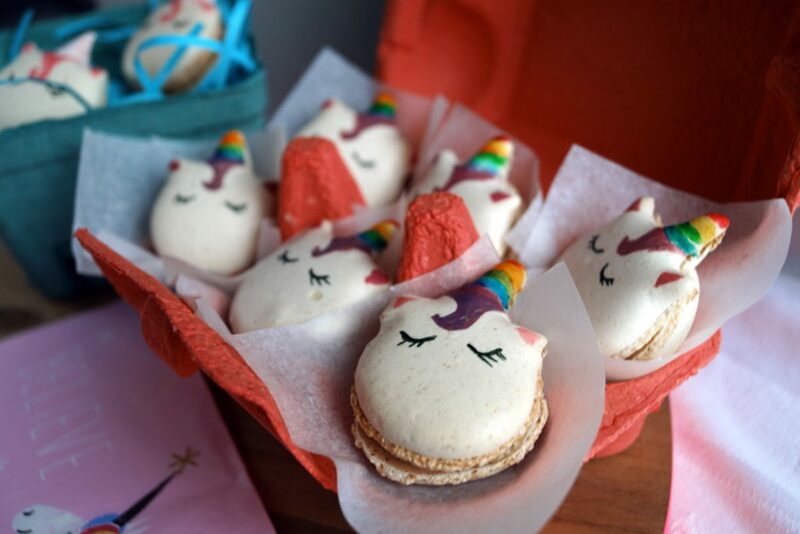 Lighlty press the inside of the Macaron shells, pipe a dot of coffee ganache on all round halves and top each with a unicorn shaped half.